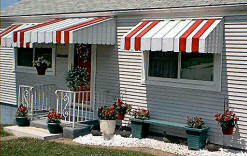 With Deck King USA Awnings you can now enjoy the finest quality aluminum awnings and canopies under the sun. Made with superior aircraft aluminum. Awnings and Canopies protect your investment in carpet, furniture, and drapes by reducing the glare of the sun Energy savings - Reduces summer temperatures in your home. Our aluminum carports, walkway covers and marquees have the handsome baked-on finish as well as the strength of aluminum to give you beauty, durability, and minimal maintenance cost. 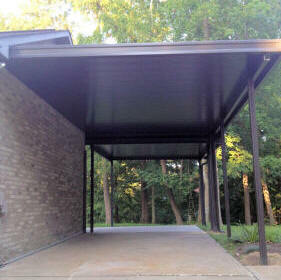 Our "Flat Pan" Aluminum Covers are also great as patio covers and covered walkways.